It's hard to imagine a business process that's more bureaucratic and messy than HR. Tons of paperwork and complicated processes are still the norm. Dealing with payroll, benefits, and recruiting is a stressful experience for everyone involved — from employees to seasoned HR veterans. HR software tools have managed to gain significant traction among businesses by cutting through this complexity, simplifying processes, and automating much of the work that people once had to do by hand. To the founder that can mean saving on hiring an expensive accountant to do payroll for their cash-strapped business. To the manager responsible for dealing with paperwork it can look as automatic filling and delivery of the forms they need when they need them. To the employee it can be a simple system they use to book time off, review their benefits, and more. 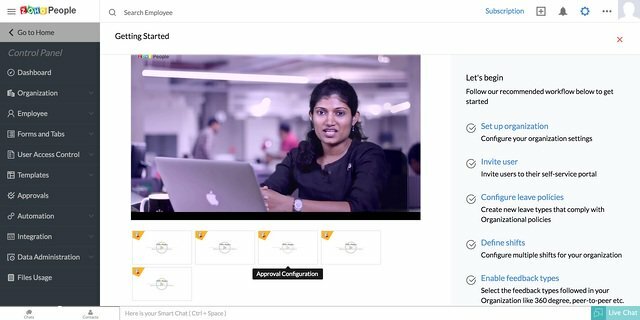 The user onboarding flow is the best opportunity to demonstrate how a tool can help companies deal with this complexity. In this article we look at how some of the most popular HR tools demonstrate their value when they're trying to win over a new organization. 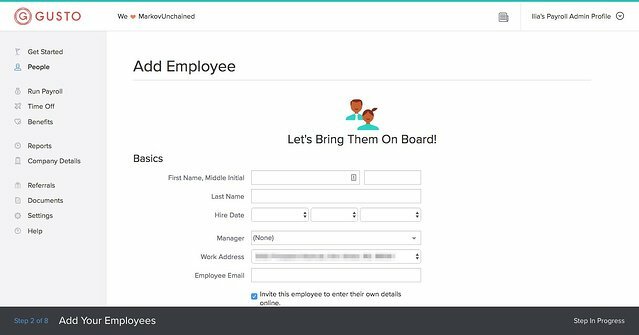 Zenefits revolutionized HR for small and medium companies that cannot afford to hire a dedicated team. The company's success has been built around founder Conrad Parker's dedication to identify archaic paper-based processes and build great software to optimize them. 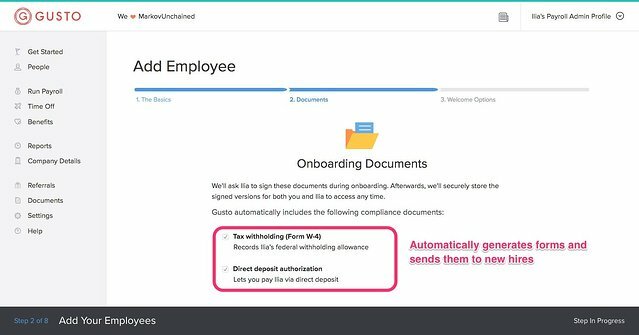 Zenefits uses the onboarding flow to take an experience that's typically messy — getting started with an HR software tool — and making it seamless for users at each step. 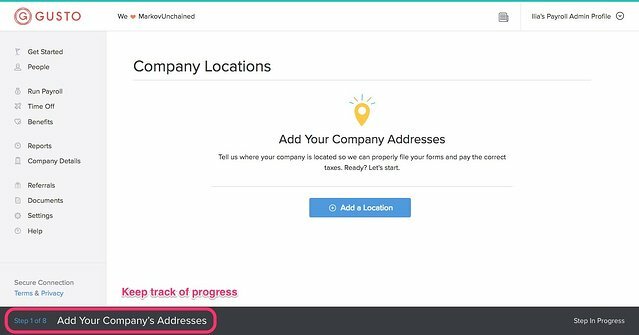 The first steps in the process take users into a fictional company where they can see what a fully developed company profile would look like without having to do any extra work. Sample data: The modal on the first screen makes it very clear that users are looking at sample data. Using sandbox data in a SaaS free trial is a smart way to get users to experience the product without investing a lot of time or energy upfront. Re-emphasize value with an upsell prompt: Users get a CTA to upgrade as soon as they pick a plan. This is a good opportunity to remind users what a paid subscription can deliver. Clear steps on home screen: Users know what they need to do to start experiencing the value of Zenefits. “Estimated time” adds reassurance this is not going to take them too long. Copy/paste employee data from an existing spreadsheet: It's easy to switch from an existing solution and they don't need to learn a new behavior. Where Zenefits is taking on the entire HR market, companies like JazzHR are focused on specific verticals like hiring. This is also reflected in the way they onboard users. Posting job ads to multiple websites is a big hassle for the people who're hiring for their teams. They're looking for a simpler and quicker way to manage their ads, collaborate with their team, and hire the best people. 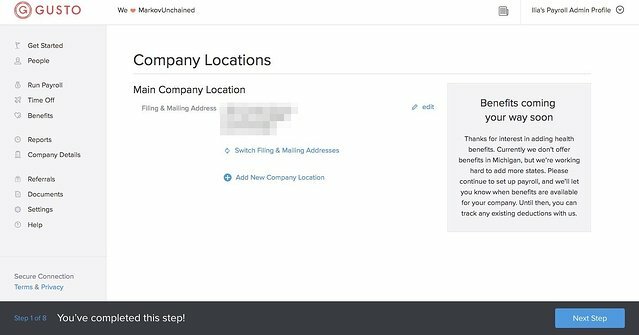 JazzHR uses the onboarding flow to demonstrate how it can be done like magic — with one-click posting to multiple websites. Start with the most relevant step: On the welcome screen, users are presented with a choice of what task they want to start with — all steps are independent of each other, so customers can pick and do the task that's most relevant to their context. The Aha! moment: Users discover the value of the tool when they post a job — it takes one click to post to multiple sites. It works like magic and has the potential to save hours for the customers of JazzHR. 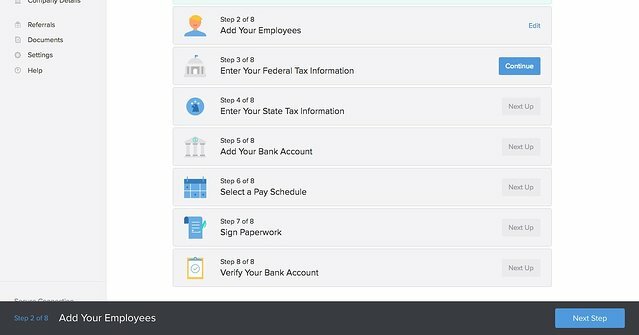 Support users during the process: The form to add a job is very long and intimidating — JazzHR needs multiple tooltips to walk users through each step and explain why it matters. Walk users through the initial stages: Each step in the onboarding process initiates a series of tooltips that walk users through the steps it takes to complete. While the tooltips like “Click Settings” drive attention to the task that needs to be performed, the copy should also explain how users will benefit from doing it. 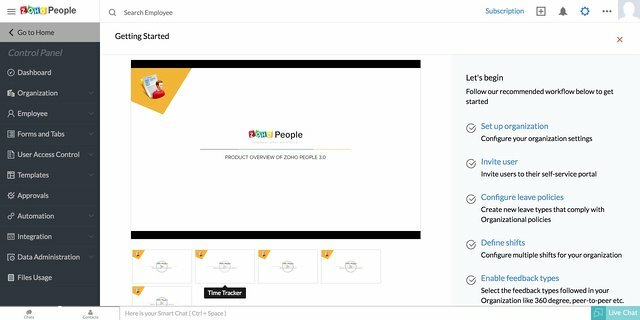 Zoho People allows companies to manage their full cycle of HR activities including tracking attendance, managing paid leave, organizing appraisals, and more. However, if brands like Zenefits and Gusto are looking to reduce complexity and simplify these processes, Zoho People does little more than transfer processes that people are familiar with from paper to the cloud. To take advantage of the tool's features, Zoho customers have to set up the core rules and policies that govern how they manage their workforce. 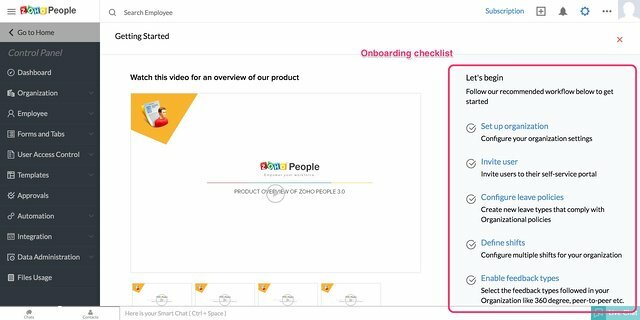 Zoho uses the onboarding flow to educate its users on how to perform these core steps that allow them to take advantage of the product later on. 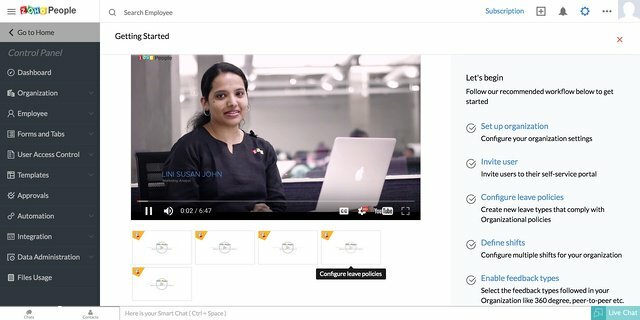 Explainer videos: Zoho uses video to walk users through the most common — and challenging — tasks, such as setting up leave policies, approvals, and more. Watching someone else do it, helps users get a feeling of what they need to do. 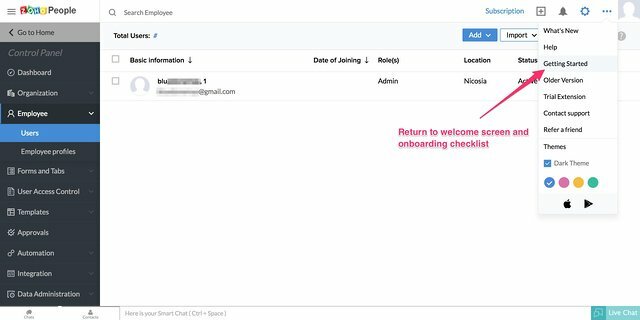 Onboarding checklist: Clicking on a task in it takes users to another page. The only way to return to the welcome screen and continue following the steps in the checklist is by clicking on a link in the dropdown menu. This makes the checklist hard to follow. Breakout from onboarding at any point: Users are free to navigate from the onboarding process and start using the product at any point. If they click on an item in the checklist, they don't get any more instructions on how to complete the steps. We know HR people wear many hats, and, until today, they’ve had to log into multiple systems to manage compliance rules, process paperwork, and access employee information [...] Gusto gives them one home for HR, payroll, and benefits so they can spend more time welcoming new teammates and empowering them. 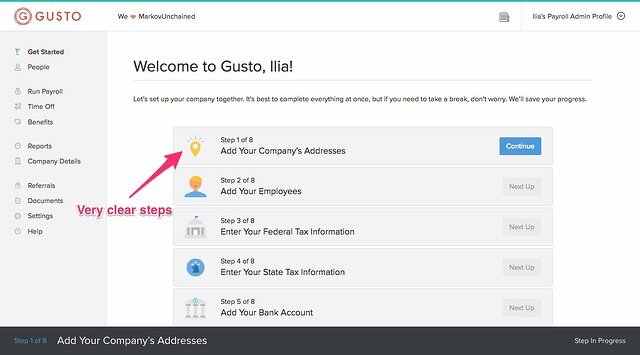 To accomplish that level of simplicity, Gusto needs to collect extensive data about each customer and it uses the onboarding flow to achieve this — not just by making users go through a series of forms, but also by showing how them the value they can get from the tool. For anyone who's had to organize HR work by annotating a pdf or scanning paperwork, the ability to fill forms out by typing a couple letters and pressing a button is awesome. 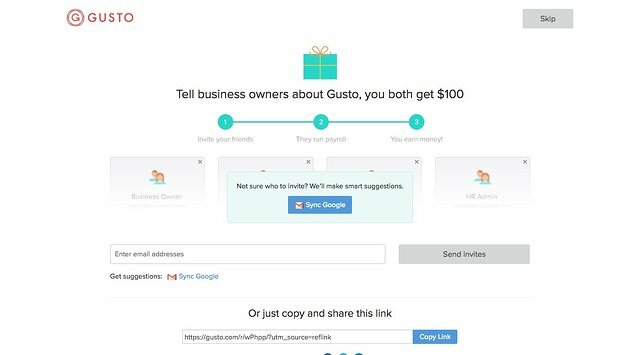 CTA to refer new users: The first screen users see is a push to connect their email account and invite their contacts to try Gusto. This is an odd choice provided these users haven't even had a chance to experience the product for themselves. Referral marketing is a great opportunity, but it should be used at the right moment. Straightforward list of steps: Gusto needs to collect a set of data from its customers to deliver its value. The app uses a very straightforward list of steps that first-time users need to complete during their initial visit. 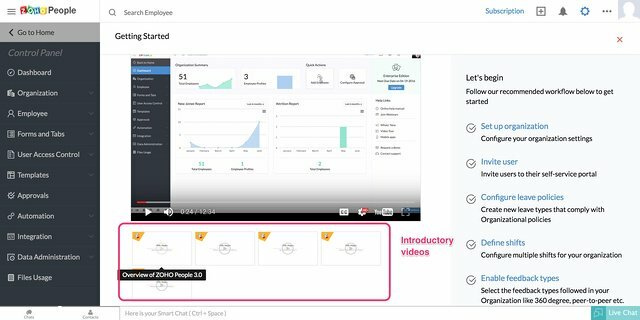 Getting potential customers to complete these steps during a free trial of the product increases the chances they stick with Gusto long-term — since they've already put in the work to build up their profile. Demonstrate value: Getting users to provide a lot on sensible data isn't easy, so Gusto does a great job of showing the value it can create for its users by having access to their information. For example, demonstrating how the app can generate and deliver compliance forms for new employees is a powerful Aha! moment for anyone who had to deal with these manually in the past. HR software brands are quickly carving out a large piece of the HR industry because of their ability to simplify messy processes. To get to that point, they need to prove their ability to bring meaningful change to how businesses deal with managing HR. 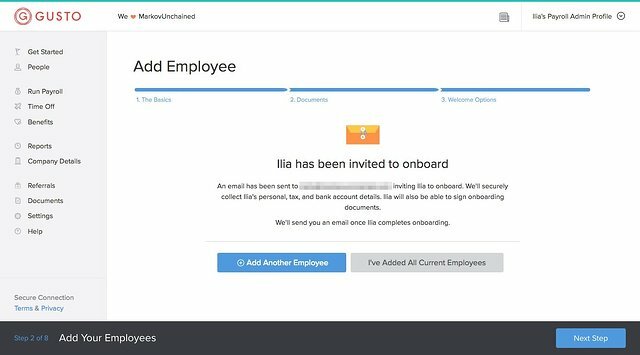 The onboarding flow is the perfect opportunity for these tools to wow users with all the benefits they can provide.